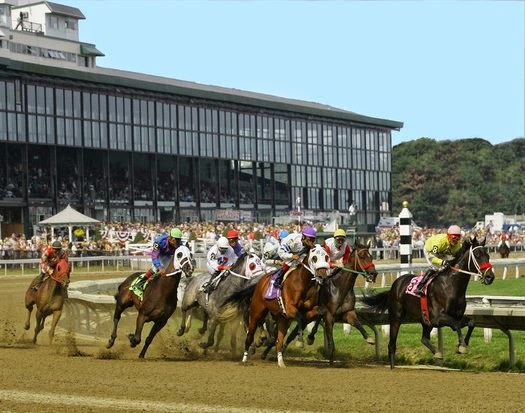 Twice a month Brooksby Village offers a trip to Suffolk Downs, which is a thoroughbred race track in East Boston, Massachusetts. Friends who have gone to the racetrack have told me about the great seats they had in the air-conditioned restaurant overlooking the the finish line and the wonderful buffet luncheon. It was time for me to check it out before it no longer exists, depending on the outcome of this months casino decision. From what I observed, most attendees at the track were seniors, who came with a group bus like I did. We were given a racing program with an explanation of the betting process and our own betting windows. Since most of us were "of a certain age," the betting windows couldn't have been closer. The buffet was a bit of a walk but I guess they figured "we had to eat" and would make the effort to get to the food! I started out betting $2.00 to WIN. I lost! After a few races I bet $2.00 to PLACE. I lost! After those losses I bet $2.00 to SHOW. I won .40! The lunch was good, the races were not my cup of tea! I got to talking to a fellow gambler who lives here at Brooksby. When I told her my name she asked if was related to John Garfield - not the actor but someone who she worked for when she first got out of high school. Lets say she was in her early 20's at the time - now she must be in her 80's - that means it has to be about 60 years ago!!! She worked as a bookkeeper for my cousin John Garfield!!! We exchanged memories about her boss and my cousin. He was the type of person that made an impression on you - tall, handsome and a charmer! Even though she enjoyed working for him, she did leave when a better position was offered to her. In my previous post I wrote about "If You Don't Go Out, Nothing Happens." I didn't win at the races, but I had an opportunity to share some memories with someone who knew my cousin so many years ago. What a wonderful experience for you. Well my mom always said behave in public because you never know who you'll meet that knows you or someone they know that knows you. That's great! You really know how to enjoy life and make the most of things! My cousin just won $40.00 at a race track, and she was thrilled. So maybe you should try again!